I would like to see the movement of the keywords over a time period instead of just daily. 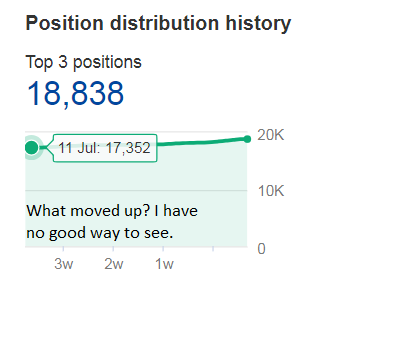 So when we see a traffic drop/gain in the Organic Traffic and Organic Keywords over say a month we could filter the movement to that time period and see what keyword contributed to the drop/gain. Right now I have to look at each day and the fluctuations and try to eliminate the keywords that are still ranking or just switched pages before I can look at what is really missing. It is really tedious and most of the time I don't bother because it is too hard to work with 30 different files. I would like a way to look at the keywords that were ranking a month or so ago and compare them to the ones ranking now. This would be really useful for the pages ranking in position one to three. Then we could see what keywords are ranking better/worse than they were a month ago.